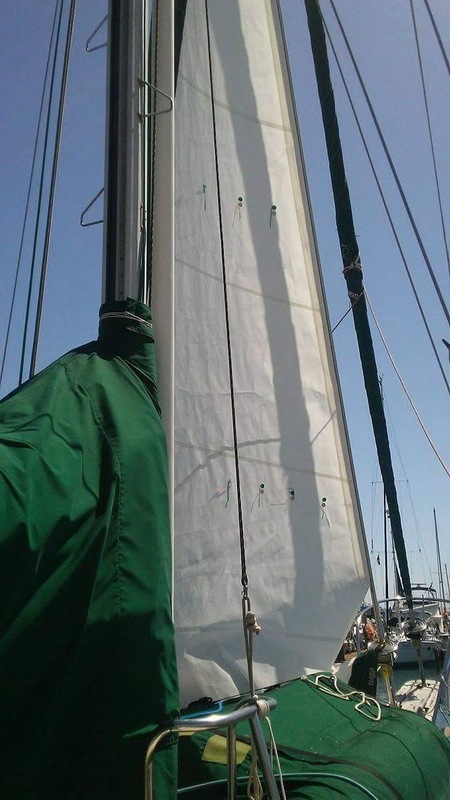 As a sailboater your rig and rigging is an important part of how you utilize the wind to slosh through the waves. First hand knowledge of your rigging is paramount. That being said, two weeks ago I was up the mast cleaning the standing rigging and inspecting all connections, shelves, spreaders, blocks and tackle and attachment points. I used white vinegar, a stainless brush and a terry cloth towel. The white vinegar removes the surface rust very easily and those stubborn areas yield to the stainless brush. Do not use other chemical cleaners to clean your standing rigging. While up the mast enjoying the view and whistling away, I observed that the staysail’s #6 luff tape had some serious sun damage on one side. I picked up some #6 luff tape from the sail loft while I was in San Diego to replace the tape. After getting the sail down on the deck and off the furling tube, I started carefully ripping out stitches and separating the UV cover, head webbing, and old luff tape. As you can see in the following photograph the luff tape unprotected from the furled sail had 9 years of cumulative sun damage. Nothing last for ever in Water World. There are a couple different ways to effect this repair. I tried to keep it simple and stuck with the original design of the sail maker. I removed about six inches lower than the damaged area to make sure I got all of the deteriorated tape. I cut straight across the tape down to the edge of the sail material and then carefully used a razor blade to trim each leg of the tape. To check the Dacron tape for sun damage, use your finger nail to try to lift it up. If it tears easily there is sun damage. You are on borrowed time and you should consider a repair in the future. Once the old tape was removed, I started to work on a splice to join the two pieces together so it will glide easily up and down the furling track. The sail loft suggested that I use a piece of sail tape to overlap each side of the two pieces. I decided to remove some stitching on the new luff tape back about two inches and removed the nylon rope and the plastic bead so the fabric of the new tape would overlap the rope and bead of the older tape. I used some ¼” seam stick on each side of the sail to hold the luff tape in place to while I used a zig zagstitch to secure it into place. I used a straight stitch to secure he splice are of the new and old tape with a row of zig zag down the middle. The finished product! A Sailrite machine was used for the stitching. A razor blade and seam ripper used to remove old stitching. As well as some seam stick and new #6 luff tape. About two hours expended from start to finish. Repairs were performed on the foredeck atop the bottom of my inverted RIB which made a great platform for the work to be performed. Hoisted the staysail, rolled it back onto the furling foil, put the equipment away and cracked a cold one. 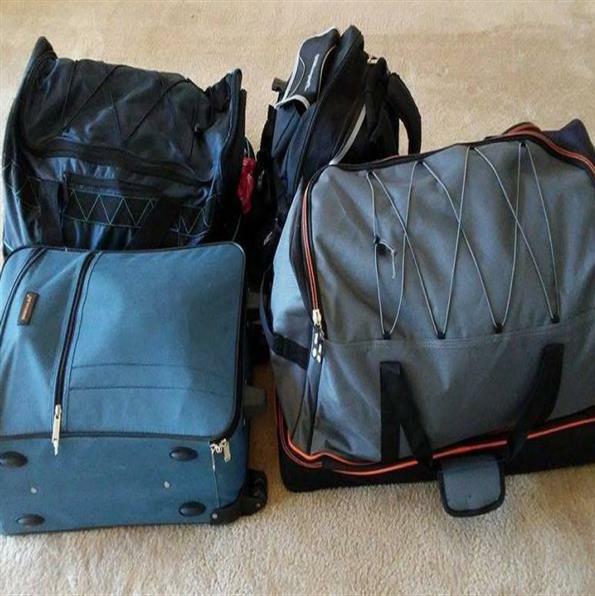 Three Duffel Bags And A Backpack! If you are reading this blog you have probably thought about what it’s like to live on a boat. If you haven’t then this will really be a shocker for you. Dazzler is a beautiful 36’ Union Polaris sailboat. She’s got lines on her that would make a Victoria’s Secret model jealous. I love her and I totally understand Dan’s complete devotion to her. But the one thing I found is that when you initially think of living on a boat you don’t really comprehend the downsizing process you will endure to get there. After my Christmas trip to Mexico in which I stayed 18 days, we decided I would close up my apartment, finish out my job and move back to the boat. The whole process would take 4-6 months. I arrived home on January 9th, 2017. Let me explain that I did not live a lavish lifestyle…comfortable but certainly not lavish by any stretch. I had a modest 910 square foot, two bedroom apartment on the water in Bradenton, Florida. I lived with my furry children. If you would have asked me when this all started, I would have told you that getting rid of my “things” would be the easy part. It was rehoming my “kids” that would be the worst part. Little did I know or understand how difficult it would be to part with my “things”! Don’t get me wrong, I’m no hoarder by any stretch of the imagination. I’ve been known to throw out things others would beg for but when you finally realize that you are going to have to reduce your entire 49 years of existence into 3 duffel bags and a backpack the “sh** gets real” as they say. At first it was easy. I got rid of the stuff I’ve been dragging around that I never look at or really care about. I did this in stages to make it easier. I got rid of the easy stuff over the course of a month. It was like “spring cleaning”. There was nothing too traumatic or worrisome to deal with here. In fact, I actually psyched myself into believing that this would be the easiest thing I have ever done. Then came mid-February and the real trauma began. This is the time I started sorting through the “real stuff”. You know, those memories and things you’ve hauled around for decades? Yep, those things you only look at when you move but you can’t seem to part with because they are a part of your past. It’s here that we separate the women from the girls or men from the boys, whichever. Now, I’ve watched Tiny House Nation more than a few dozen times so I immediately thought I was an expert at downsizing. Yeah….not so much. I tried the part where you divide things into different piles but that didn’t work because EVERYTHING I owned had a meaning. Yep, I’m that person. If I had it hanging on a wall or sitting on a table, it came from a vacation, family member or other memorable occasion. How on earth can I be expected to get rid of that Ricky Ribbet banner that was a part of a business my dad and I created? Or worse yet, what do you do when you have been the family historian for 30+ years and you have boxes and boxes of pictures and videos? Yes, “the sh** got real” and quick! The memories and feelings started to overwhelm me. I found myself in tears sometimes for no apparent reason. Poor Dan had to deal with my drastic mood swings from thousands of miles away. One minute I was so upbeat and psyched about moving to be with him and the next I was in tears and sobbing because I was leaving my things, family and “kids”. So much for the “easy part”. It took a couple of weeks, lots of talks with Dan and friends and some old fashioned determination but I finally got it. The fact is, it’s just stuff!!! The pretty red dish I bought in England or the leather mask I got in the Bahamas or the beautiful vase I bought at Amelia Island, they are nothing but THINGS! I don’t need them to remind me of the times I spent in these places. I’ve got memories for that. But, I’m a very visual person so I knew I needed something more. Know what I did? I took pictures of these items before getting rid of them. That’s something the digital generation has given us. The ability to keep those wonderful keepsakes without having to store them. Once I started down that path it was so much easier to purge myself of life’s anchors. And you know what? I started to feel so free and fresh and like my whole world had just opened up before me. No longer am I tied down by my past or to the trivial “treasures” of life. I am now free to truly experience life and enjoy the journey and adventures ahead. To those who are thinking of moving to live on your boat I must tell you that the journey to get there will be tough. No matter how much you want to live on your boat there is still a past that you must leave behind to get there. Take it slow and embrace the emotional side. There’s so much to our lives that we need to recall and embrace….even the bad stuff. If you do it right you will come out on the other side ready for adventure and a life of simplicity in paradise! It took me three months and I’m almost there. I left my apartment and have been living like a gypsy for the past five weeks. I have become a professional couch surfer! I spent a month with my nephew, Brandon, enjoying some great bonding time and now I’m at my mom’s for another month. In just 25 days I’ll be meeting up with my love in San Diego where I will meet his family and then we will drive back to the boat in La Paz, Mexico. The journey has been tough at times but nothing worth having is easy. I’m looking forward to my new life with Dan and the wonderful adventures we will enjoy together and I know the journey has been worth the trials I endured to reach my destination.